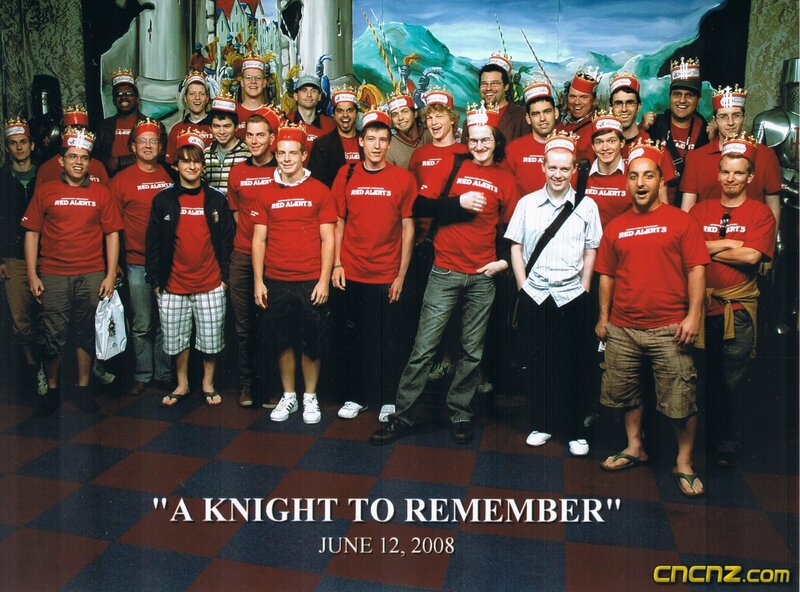 CNCNZ.com has been invited to many EALA summits over the years, even to some Westwood events a long time ago. We have sent different staff members such as Saracen and Zee Hypnotist to represent our site at each event for games ranging from Battle for Middle Earth, Command & Conquer 3 and Kane’s Wrath. For the first time ever I was able to actually attend one of these after many attempts by APOC to get me there. This article is simply a report on the actual trip, what we saw, what we did and so on. You won’t find any detailed information about Red Alert 3 here. Our NDA strictly states what we are allowed to report. Plus I never really took any notes so this is all coming from my memory. 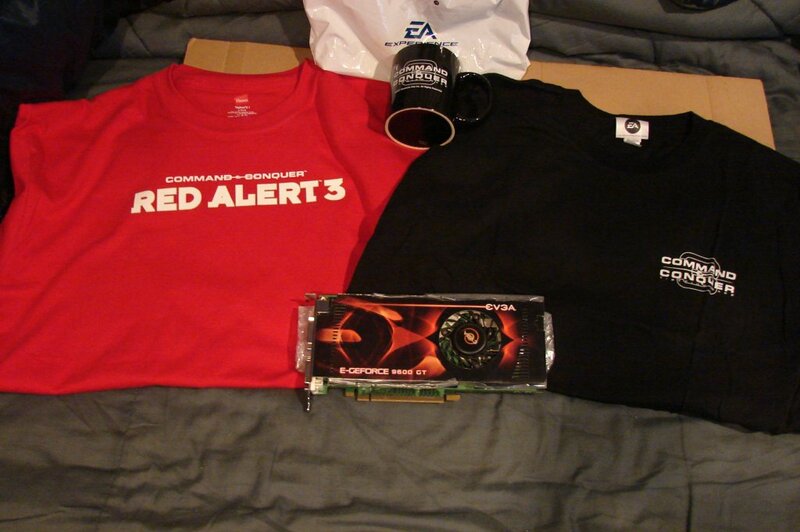 It’s not all bad though, all the important Red Alert 3 details will be emerging in the near future. On Wednesday June 11th 2008 I prepared for my flight from Auckland International Airport to Los Angeles, my flight left New Zealand at around 8 PM. This was my first ever flight overseas and since it was a direct 12 hour flight I wasn’t sure how I would react once I arrived at LAX. The flight was smooth and I managed to get in a few hours of sleep. 12 hours later I landed at LAX and thanks to the magic of time zones it was still Wednesday June 11th, only it was 12 hour earlier. So this was the longest Wednesday in my life. 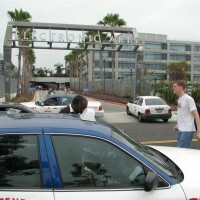 It was hustle and bustle getting through the standard formalities at LAX such as security and customs. The one thing that stuck out the most to me was how the Homeland Security officers showed no emotion when greeting you, were all Americans like this? Of course not I thought to myself. The longest wait was at the baggage claim area, it was a somewhat nervous wait as well, because I will admit, the only thought in my head at the time was what will I do if my bag gets misplaced? Those thoughts soon disappeared as my bag came flying down the chute, almost like it had been fired out of a man cannon. With my bag finally in hand it was time leave the Airport and grab a taxi to the Ritz Carlton hotel. The main thing I noticed during the taxi ride to the hotel was just how poor the road conditions are in Los Angeles, compared to what we have here in New Zealand. Granted it’s not an important part of the trip, just something that stood out to me. 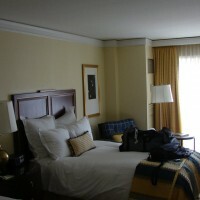 The Ritz Carlton is a five star hotel. 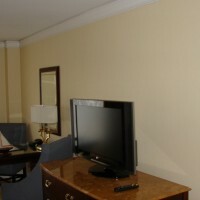 I was only staying in standard suite but it was very impressive. 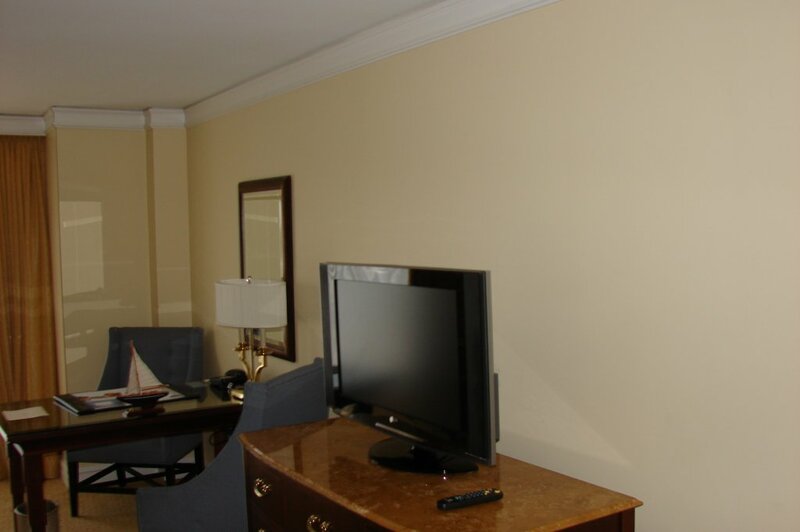 A nice big bed, fancy desk and a 32″ LCD TV, even though I never watched much TV, what I did see was total garbage, much like TV is here in New Zealand. The friendly hotel staff insisted that I try their fancy pool, but I wasn’t here for a quick dip so I never packed my swimming gear, they were right though, the pool was indeed very cool. It was around 3 PM in the afternoon and when I met up with my room mate for the next few days, John (Ang3lic) from GameReplays.org. We basically killed the time that afternoon chatting and getting to know each other, also discussing what we could expect in our visit to EALA the following day. 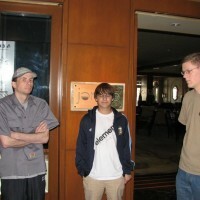 APOC told us to meet him in the hotel lobby at 6.30 PM. Since APOC was traditionally late it was a good opportunity to finally meet some people I had known for a long time but never actually met in person before. People like Chickendippers from CNC World, HeXetic from Planet CNC and JohnWE from CNC Files. There were many other guys there but their names escape me. Finally APOC showed up at around 6.45 PM, a little late but I was told he would be. APOC did a quick greet and handshake routine then it we all got into taxis and headed to a restaurant called “The Terrace”. 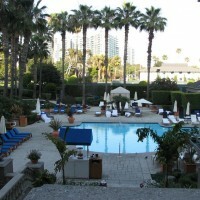 This was a nice place; it was located really close to the beach. We had a semi-private room towards the rear of the restaurant. As stated above it was a meet and greet dinner. 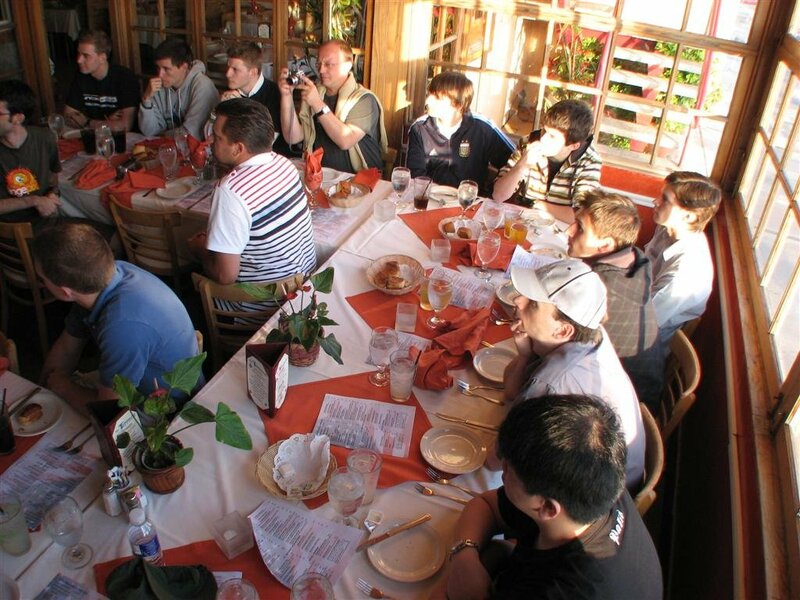 During the meal we set aside some time to go around the table, introduce ourselves and mention what sites we were representing. APOC also gave his clearly unrehearsed and ad-libbed welcome speech. I was hungry but not interested in a huge dinner, for the meal I picked the Spaghetti Bolognaise, thinking it would be a decent portion served in a bowl. I was wrong, when the food arrived this massive dinner plate loaded with pasta and sauce was dropped in front me, I knew I couldn’t eat it all but it was super tasty. I should also mention that David Silverman joined us at the Terrace as well. It was an unexpected appearance but it was great to meet the main man behind the creation of Battlecast Primetime. It was getting late, I was feeling tired now after the long flight, so when APOC started to arrange taxi rides back to the Ritz Carlton I took advantage of the first one to. Back in the hotel room it was time to get some decent sleep in, because the next day would be a long and busy one. 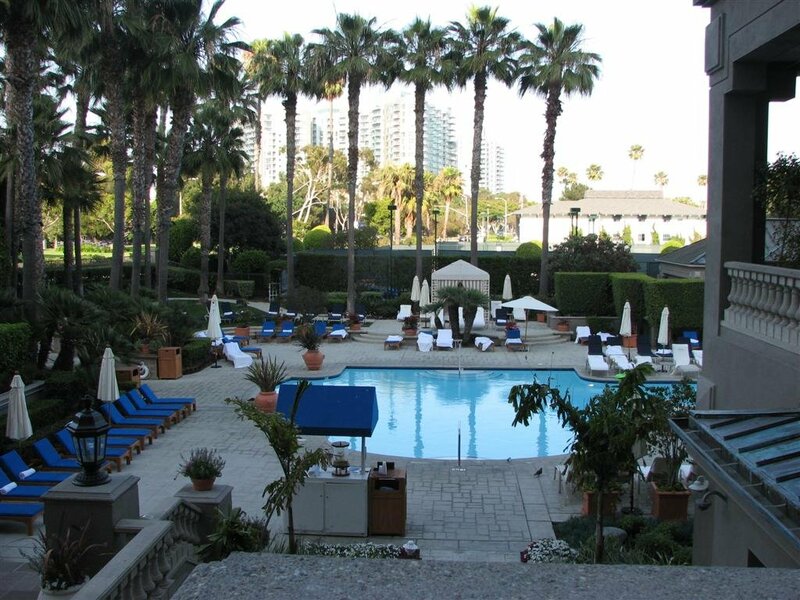 The night before APOC said we will all meet in the lobby of the Ritz Carlton at 8.15 AM sharp. Once again we were all there waiting for our host, it was at this time we all agreed that APOC operates in his own time zone, officially referred to as “APOC Time”. All jokes aside he wasn’t that late and we were on our way to EALA by 8.30 AM. 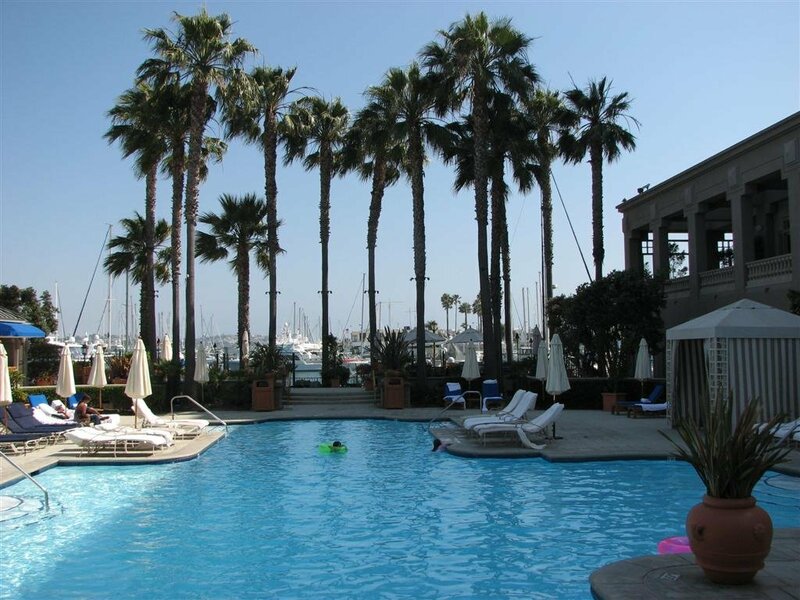 EALA is located in the Playa Vista area, which is only a short drive from Marina del Rey. I was in a flash town car (supplied by the Ritz Carlton I think) with Tchutch from CNC Saga, and we were the first group to arrive. After explaining who we were to the security guard at the gate and then a quick phone call she let us in. From here we found our way up many stairs. Then entered the main foyer of EALA and waited for the rest of the group to arrive. Inside this main foyer there was a small cafe style counter selling coffee and food, an Xbox 360 and PlayStation 3 set up demonstrating EA’s latest and greatest games. Even some fancy mobile phones were on display showing EA’s mobile gaming range. 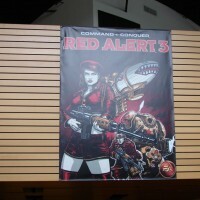 Looking around the room you couldn’t help but notice the giant Red Alert 3 poster hanging above. 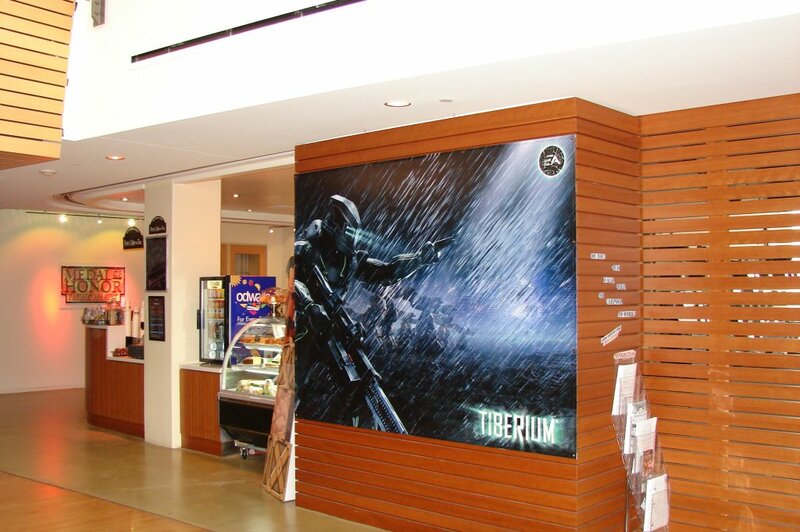 There was even a cool looking TIBERIUM poster dominating another wall. Oh yeah, we were reminded about that Tiberium game as well. 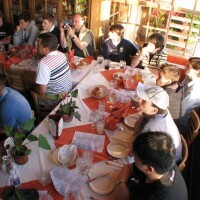 By now it was time for breakfast; we headed across to the other main building and then to EALA cafeteria, called “EAts”. 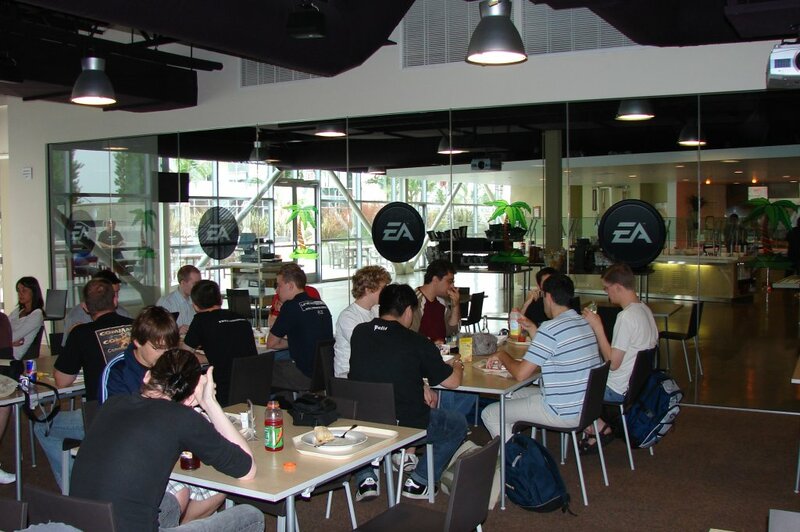 A lot of the community guys went for the famous Breakfast Burritos, that’s why you see everyone with their arms raised in the photo below. The Breakfast Burrito is truly a meal with in a meal; it was more than I would usually eat for breakfast anyway. With breakfast out of the way it was time to head back to the other building and then into a presentation room. This room is basically a small theatre, a big screen on the main wall and many rows of tables and seats. Each row was home to many top of line Dell XPS computers with 24″ LCD screens. All the computers were Vista machines. But they had horrible computer mice connected to them. APOC basically apologised about how bad they were. It was at this point where APOC filled us in on what we would be doing for the day. The first of many presentations began with Chris Corry and Greg Black giving us an overall idea what they were trying to achieve with Red Alert 3. As well as a quick run through of the all the units and some of their features. 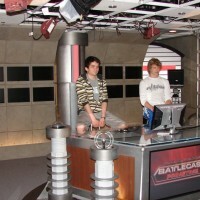 Once Chris Corry and Greg Black were done APOC decided to pick two people at random to be the first people from the gaming public to play Red Alert 3. APOC selected JohnWE from CNC Files and who was the second person? None other than me of course. As soon as APOC said he was picking people at random I knew he was going to choose me. To keep a long story short, JohnWE cleaned me up in handful of minutes. I’m the worse player at these games these days. I hardly spent any time playing C&C 3 or Kane’s Wrath, and knowing very little about Red Alert 3, other than what was just presented to us, basically meant I had no idea what I was doing in the brief match with JohnWE. Since there was some time to spare Greg Black jumped in and proceeded to totally wipe the floor with JohnWE. It was to be expected since Greg is one the leading developers. With my defeat now a memory, APOC took us on tour of the different areas around EALA. 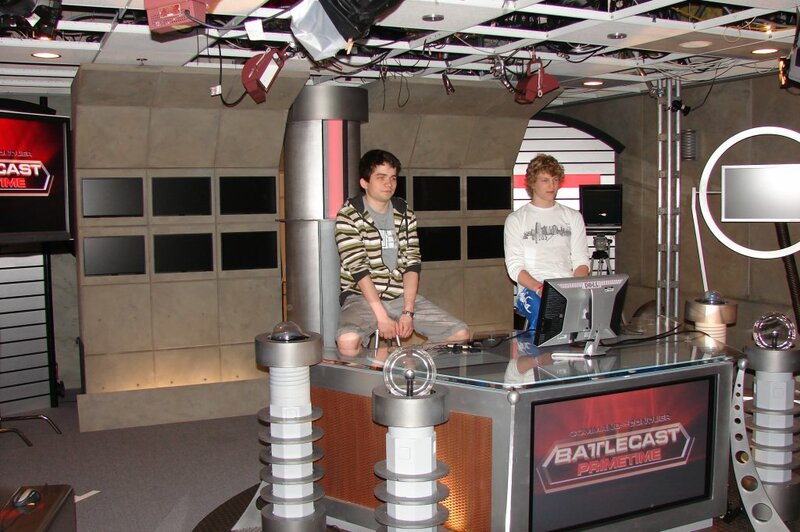 Not far from the presentation room is a small room that was once used for play testing I think, it has since been converted into a makeshift studio, this where Battlecast Primetime and all the other Command & Conquer TV shows are recorded. Everyone commented on how small the Battlecast Primetime set looked. 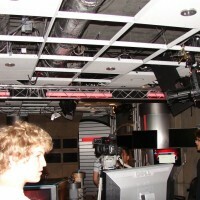 While we were there we met Matt Ott, he is responsible for the camera work and editing on the shows. He was setting up some stuff to be featured in the next episode of Battlecast Primetime. But I won’t go into details about that right now. 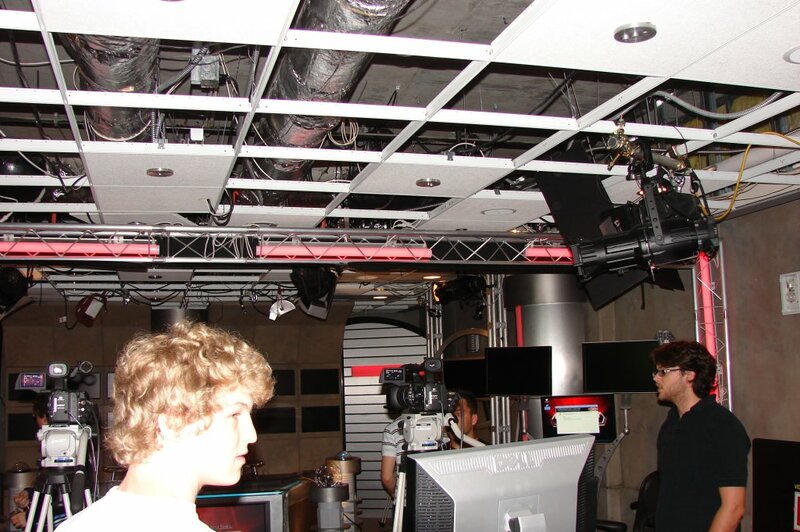 After our tour of the Battlecast Primetime set we then headed upstairs to the fourth floor. 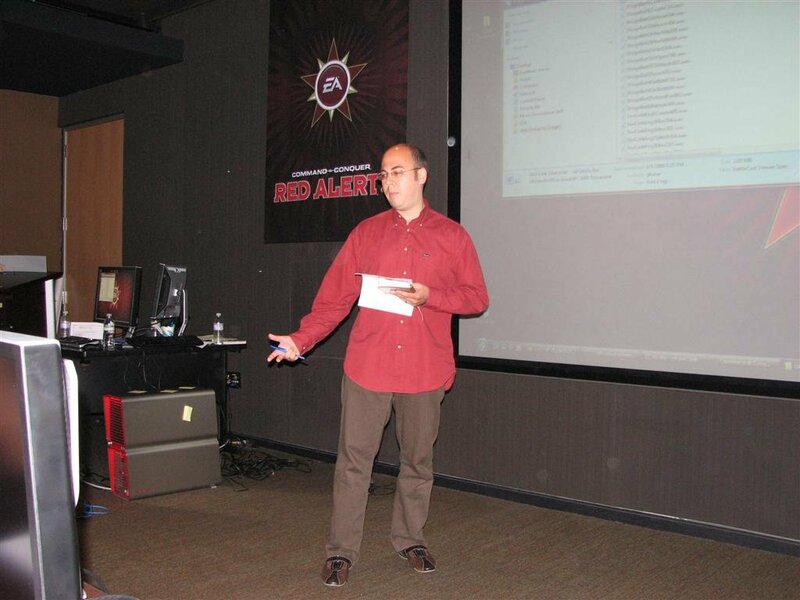 This where the all the developers worked, this was the heart of the Command & Conquer. Due to the secret information kept in this area no cameras were allowed. All we could here was walk through and say hi to people working and then quickly move on. A brief description of the area would be spacious cubicles and some private offices. 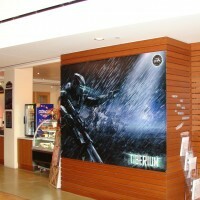 Many of them decorated with figurines, posters and memorabilia of other game/movie/TV characters and so on. It looked like a great working environment. 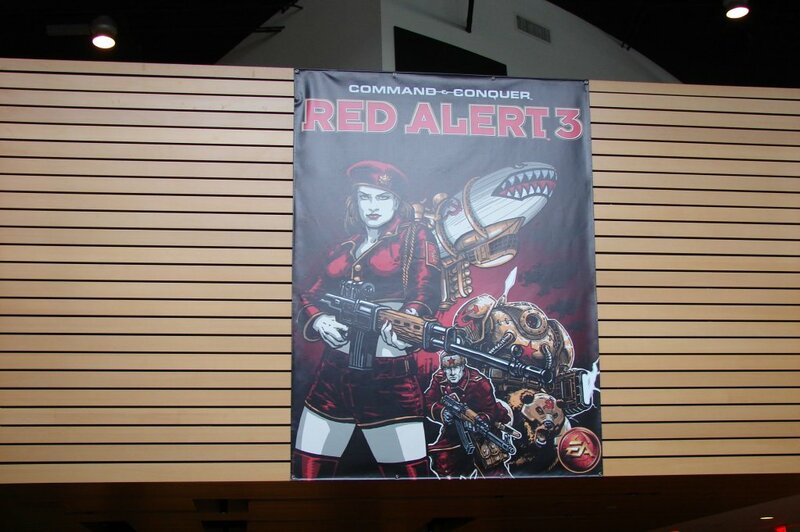 I guess it’s safe to say we did see lots of concept art and notes for Red Alert 3 and previous C&C games. And in case you are wondering, No, we didn’t seeing anything to do with TIBERIUM here. That’s a different team working on the same floor in a different area. 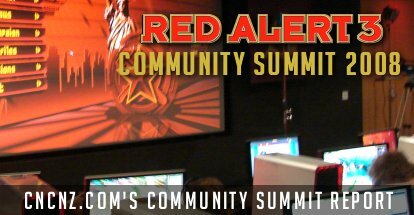 TIBERIUM was not the focus of the Red Alert 3 Community Summit so we were never going to be taken there. After the tour is was time for lunch. Some Quiznos’ sandwiches were served. For those who don’t know Quiznos is like Subway. Food is food to me. 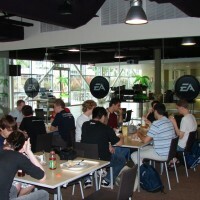 It was also at this time a whole bunch of the guys were drawn to the EA Store like moths to a flame. At $10 for PC games and $20 for consoles games how could you blame them I guess. Full of food it was back into the presentation room for what else, more presentations. I have to admit a lot of what was said at during these presentations has long since left my memory so I can’t go into details here. Just some simple mentions will have to do. The first of the afternoon presentations was from Greg Kasavin on Unit Design. Basically this was a very in depth look at each unit for each faction. Using their 87 page design document it showed us how each unit starts out in the design process, they then work from this document. Each page showed a visual reference using a well known actor or celebrity. An example would be the Spy, a picture of Sean Connery as James Bond was shown. Other stuff like possible unit responses are also noted in this document. 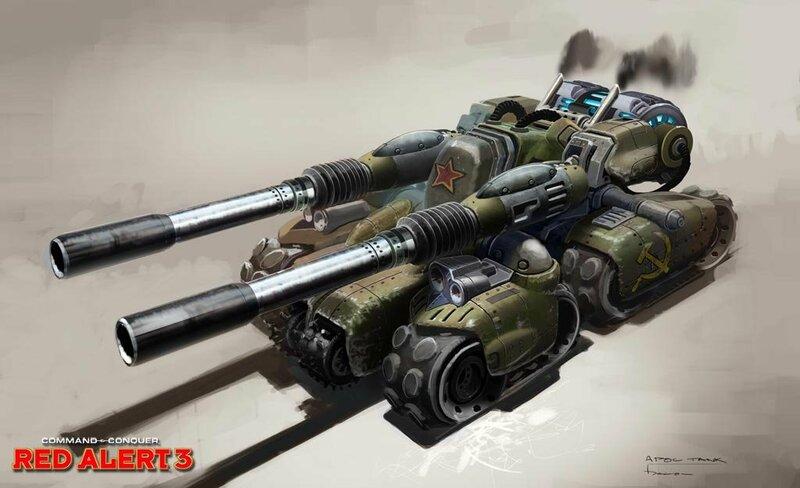 It was also during this presentation they revealed the newly redesigned Apocalypse Tank. 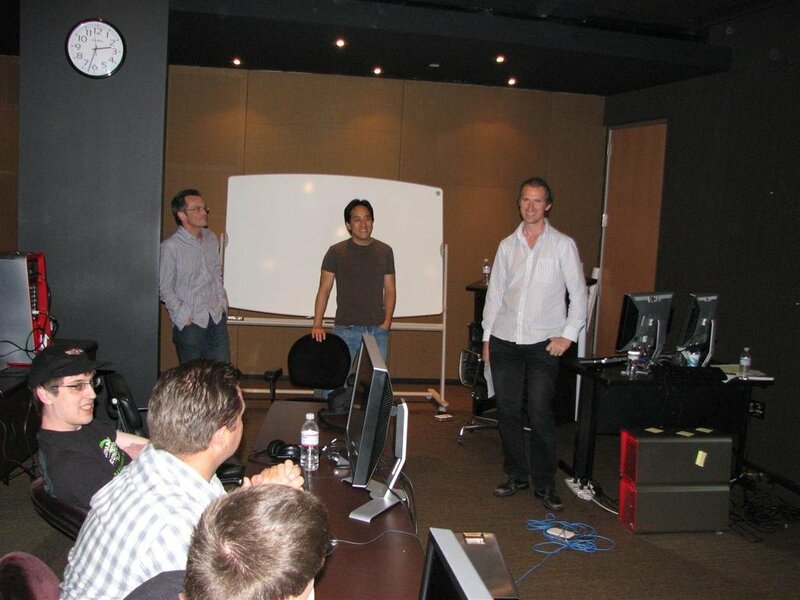 Up next was an Audio and Music presentation with Nick Laviers the Audio Director and Evan Chen the Senior Sound Designer. Nick explained how the music in Red Alert 3 will work with in the game. When you are building and exploring the music is low key, when you first spot the enemy the music will change to a more intense tone. Finally when it’s full on combat, upbeat rock music for the most part will play. So there will be no jukebox mode like the older C&C games. The music reacts and changes as you play. So who will be creating the music for Red Alert 3? It looks like they are doing it by committee. About 7 or 8 composers pitched their ideas. We listened to some of the samples they had created, I really like it, and the music had me tapping my fingers on the table to the bet. The list of composers was narrowed down to these 4 people, Tim Wynn, James Hannigan, Mikael Sandgren, and of course one and only Frank Klepacki. Frank will be composing the main theme for Red Alert 3, Hell March 3. He will also be doing some other tracks but they remain secret for now. There was a loud chorus of cheers of clapping when they played the Frank Klepacki announcement video. For the audio segment Even Chen showed us his new toy called a Vocoder. He used this software to combine and manipulate the sounds of an M60 Patton Tank and the engine room sound of the Staten Island Ferry. The result was the heavy rumbling of the massive Apocalypse Tank. 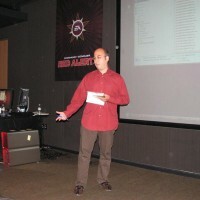 Following on but still with the audio was Michael Pedriana’s presentation on the how audio has come a long away in the SAGE engine. He used Battle for Middle for Earth 2 and Age of Empires 3 for his comparison examples. I have to be honest I didn’t find this presentation that interesting. In the end compared to other engines I guess the SAGE engine is better. With all of the day two festivities done with it was time for some fun, APOC had kept it a secret all day about where would be going. Finally he told us we were heading for a meal and show at Medieval Times. Before we boarded the bus we were presented with our official Red Alert 3 Community Summit T-shirts. We then made took a quick trip across town. A quick trip that ended up being close to 2 hours, thanks to the rush hour Los Angeles traffic. Since there was more free food on offer David Silverman and Matt Ott tagged along as well. Seriously speaking it was great to have these guys join us. Especially when David challenged 2POC, APOC’s new intern, to jump out and take on knight at Medieval Times. Strangely 2POC never followed through with David’s challenge. For those who haven’t been to Medieval Times before. 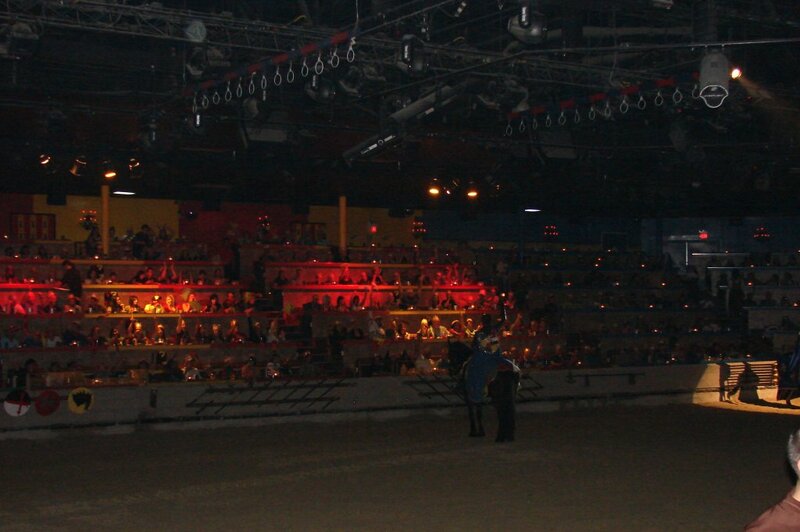 You get assigned to an area for your coloured knight, sticking with the whole Red theme, we were all seated in the Red Knight’s section, and this was all prearranged of course. 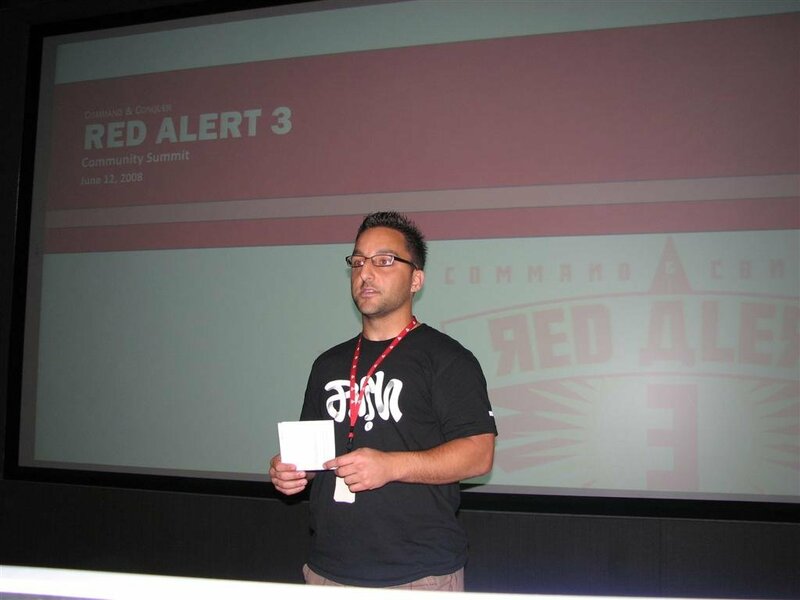 Remember, we were all wearing our Red Alert 3 Community Summit t-shirts. 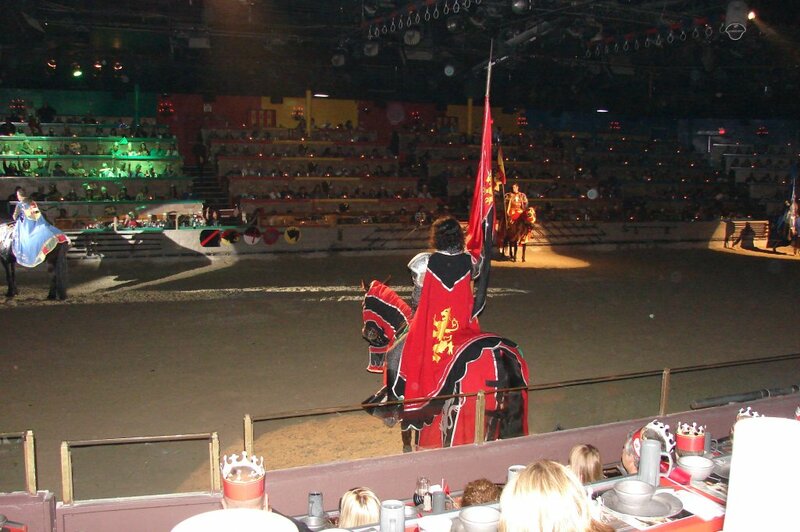 During your meal and as the show progresses you cheer for your knight as loud as you possibly can in the hope that you inspire them on to a victory. It also works the other way; you can boo and talk trash to the other coloured knights. APOC decided to challenge the Black and White Knight by screaming really loudly at him. The Black and White Knight heard him at looked straight up us, since I was sitting next to APOC. 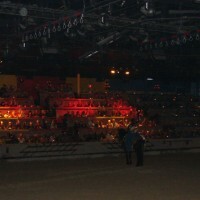 It was clear the Black and White Knight was put off by our loud harassment of him because he kept giving us the evil eye for the rest of the show. But it was all in good fun. APOC even got threatened by the King as he past us near the aisle. 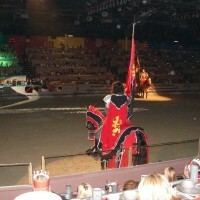 In the end our Red Knight was defeated but he put on a great show. 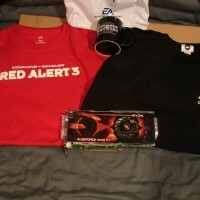 David Silverman managed to hand him his own Red Alert 3 Community Summit t-shirt. We also had our team photo taken. 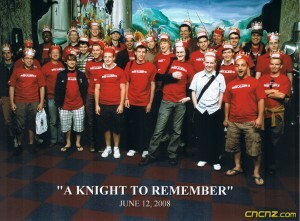 A Knight to remember… the customary group photo taken at Medieval Times. After that it was back to the hotel to get some rest for day 3. The third and final day began in the same fashion as the previous day. Meeting in the lobby of the Ritz Carlton at about 8.15 AM, and guess what APOC was really close to being on time for the final morning. Again it was another quick trip over to EALA for breakfast. 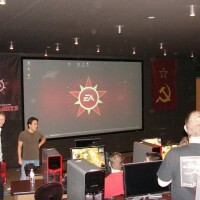 After breakfast we made our way to the presentation room for some more hands time with Red Alert 3. 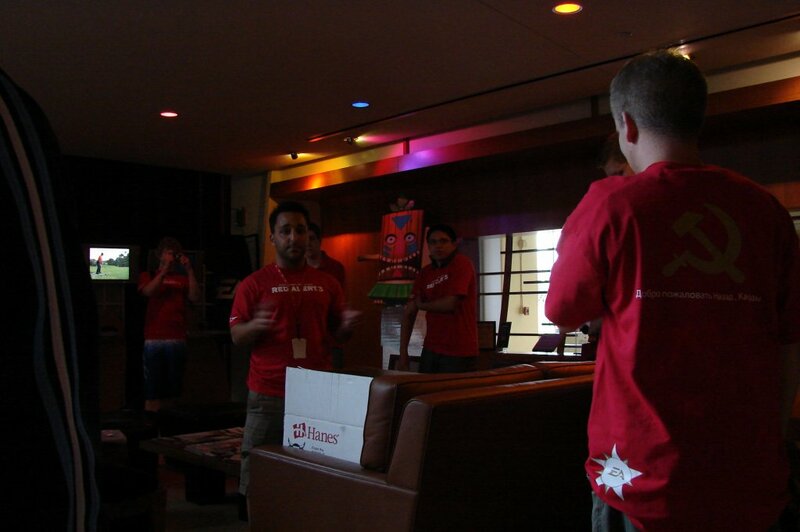 After about an hour or so of time with the game, it was time for the first of the third day’s presentations. I found this one very interesting because it was about the big redevelopment of CommandandConquer.com with Andre Bremmer and Colin Lewis. 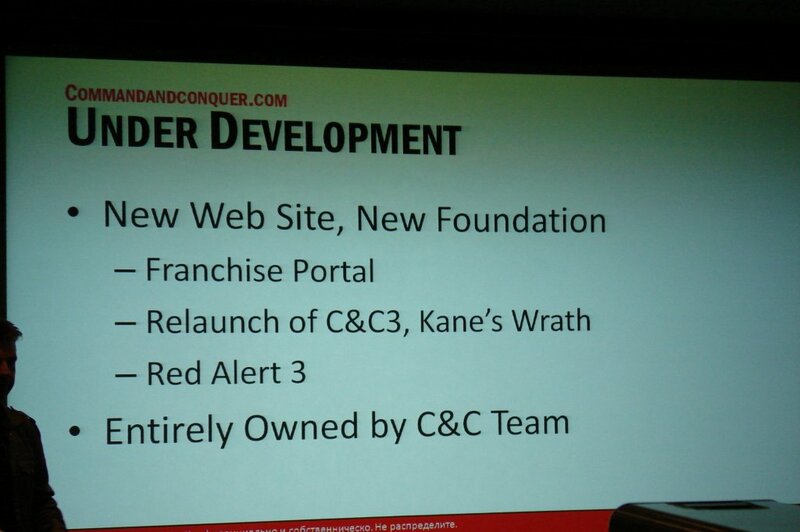 This was a very detailed presentation about what they plan to do to improve the official home of Command & Conquer on the World Wide Web. 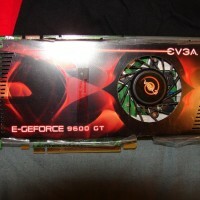 Presently GameSpy, who designed the current site, also host it. EA will essentially be taking this back and hosting the new site themselves, this will give them better access and better control of the site. This August the new C&C franchise portal will launch. 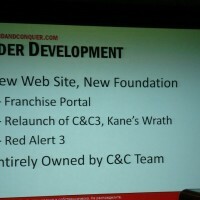 It will be the one stop official source for C&C 3 and Kane’s Wrath. The new site will feature more user interaction such as the ability to comment on contented posted. RSS syndication will be supported, rating content and much more. In October the new official and final Red Alert 3 site will launch. The biggest of the new features will be the new match making system. It will be like a social networking site but you will enter details based on your playing style, times you play and so on, this will match you up with other people to play with similar information to yours. All of this will be tied together via one user persona for Command & Conquer games. This persona or profile will be yours for life, eliminating the need to sign up for each new game. Also look for improvements with the official C&C forums. Now, everyone knows that EA’s current forums aren’t the best, they are often slow, people report it’s hard to register for them and the search function never works. There are plans to move away from the JIVE software they currently use, but it’s going to take time to transfer current data and merge them with EA’s login system. So there are better forums in the pipeline. 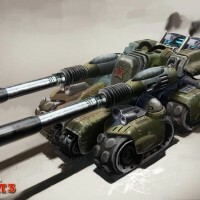 In the end what all this all means is CommandandConquer.com is going to be one of the best official sites for any game franchise on the internet. 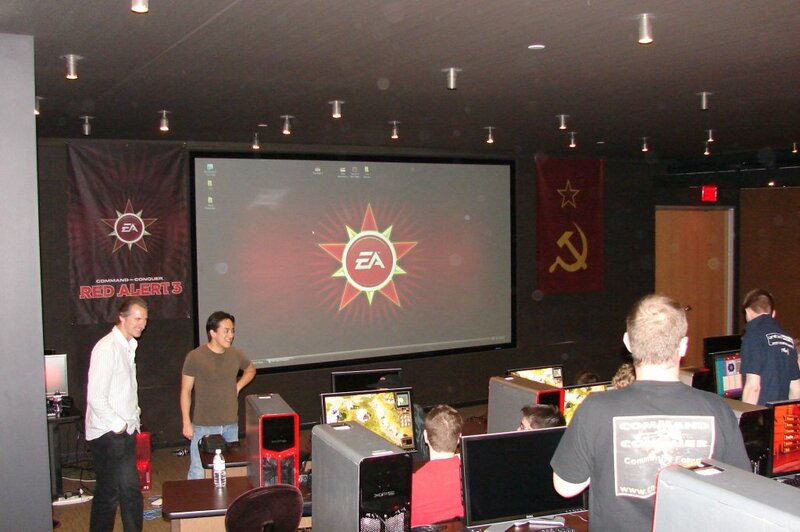 The last of EA’s official presentations was about the new Red Alert 3 Worldbuilder, I forget the names of the guys involved here though. I really can’t report much about this presentation because I’ve never used the Worldbuilder from Generals or C&C 3, so it was somewhat foreign territory for me. From what I could tell and see they are trying making the Worldbuilder friendlier to use but it didn’t seem that way, there will still be a steep learning curve. During this presentation many of the community modding guys grilled the Worldbuilder team; they almost seemed unprepared for the barrage of questions and suggestions fired at them. As they wrapped up you could tell they had lots to think about. 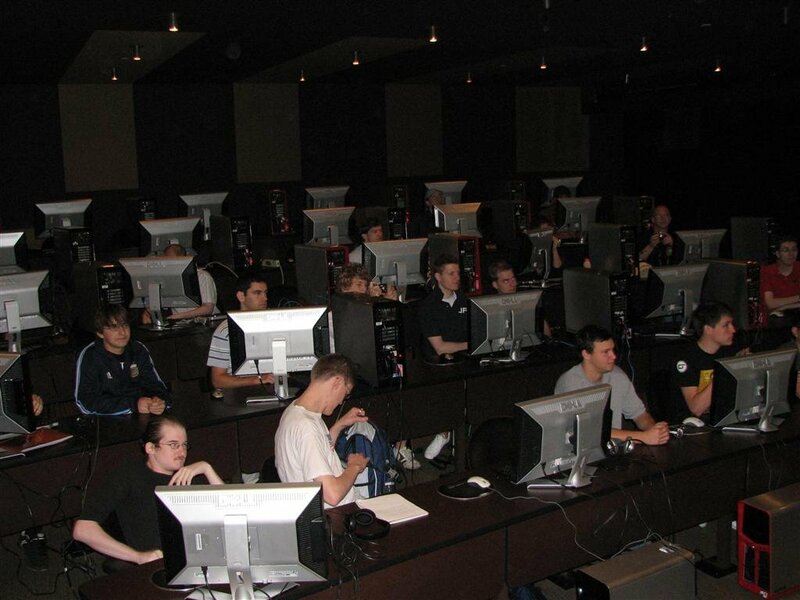 For the reminder of Friday afternoon a 1v1 multiplayer tournament was set up. I gave this tournament a miss and ducked out for awhile. The combination of bright computer screens, low level lighting was not good for me, plus the lack of sleep, the last thing I wanted to do was to sit in front of a computer screen. But I was determined to gut it out for the remainder of the day. APOC recorded his is APOC’s Corner segment for Battlecast Primetime right next to us in the presentation room. I found it most interesting to see the process he goes through to get the segment recorded right. I won’t explain it, but let’s just say APOC did a great job, considering this was the first time APOC’s Corner has been done with large crowd just behind him. It was now getting on towards 4.00 PM on Friday afternoon and we had to clear out of the presentation room because the TIBERIUM team needed to be in there for some sort of special presentation of their own, we were not allowed to sit in for this though. So while that was taking place we made our way in a smaller room just next door, I guess it you could call it a board room. In here we all sat down and had a real “Roundtable Discussion”. 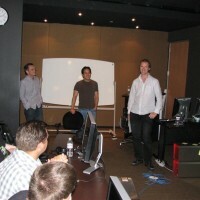 We offered our thoughts, shared suggestions and ideas while the development team soaked it all in, chiming in with questions for us from time to time. This was valuable feedback for them. We then signed our NDA agreements, I can’t help but wonder what have happened if someone refused to sign it. Anyway, these agreements doubled as a survey as well. This is where we could put our feedback in writing for the developers to go over later. After this 2POC handed out a special gift bag, inside there was a shiny new nVidia 9600GT video card, as well as C&C 3 T-Shirt and mug. We were able to return to the presentation room for the final round of presentations. I found these most interesting because they were done by some the community guys. 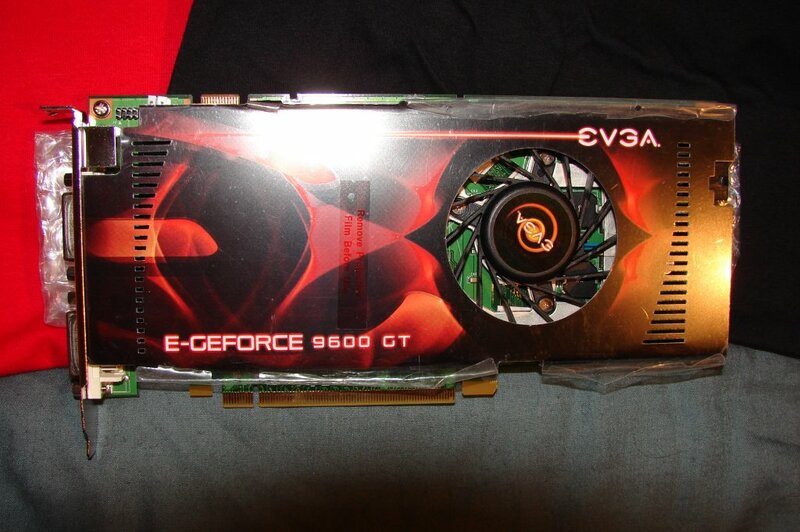 Many of the EA developers stuck around for these as well. Blbpaws from CNC Generals World was up first with his presentation on modding, and how important it is to EA and the community. Blbpaws did great job, mixed in lots of jokes as well. JohnWE presented his latest C&C fan video, which I thought was really well made. And then finally SmurfBizkit demonstrated Mid East Crisis 2 and Mastermind did a similar demonstration featuring his mod, Asylum. Once again, this was some seriously cool stuff. Some of the guys had Friday evening flights to catch so they said their goodbyes and left. For people like me who were not leaving until Saturday we were free to stick around for a while longer. APOC shouted some pizzas for dinner, while we waited for those we watched the final game of the multiplayer tournament that couldn’t be finished earlier that afternoon. 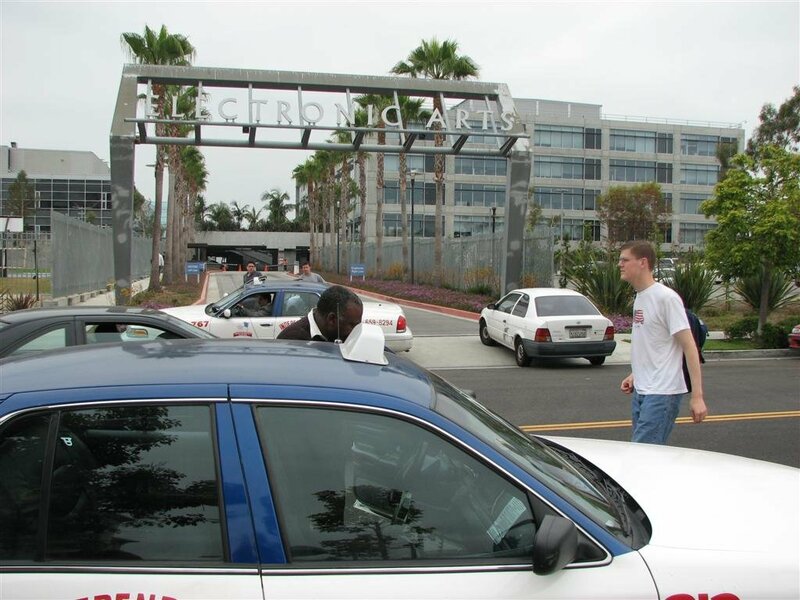 It was now getting late so APOC began arranging taxis and transport back to the hotel. I hitched a ride with David Silverman; he kindly offered to get a few of us back to the hotel on his own time. And with that all of the official events of the Red Alert 3 Community Summit had come to end. My flight home wasn’t until late Saturday so since I didn’t have to get up early I used the time to catch up on much needed sleep. I used the afternoon to take care of some CNCNZ.com related duties from the hotel room, even though this cost me $US10 for the internet access. 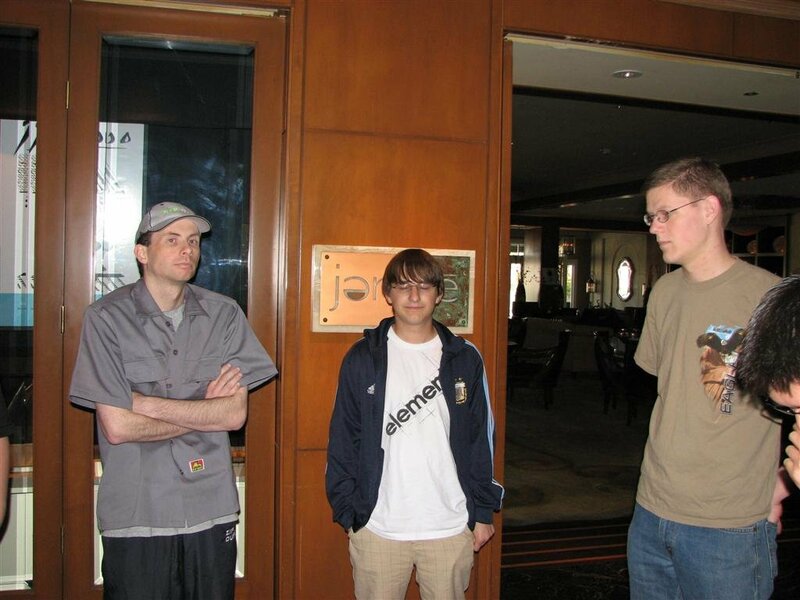 Later that day I met up with Tchutch from CNC Saga and one other person, I didn’t get his name; we all shared a taxi to LAX to catch our flights home. After 2 hours loitering around the Airport terminal, and a quick meal from McDonalds, I was finally able to board the plane. Just over 12 hours later I landed back in New Zealand, it was now around 6.00 AM Monday morning, meaning I had skipped completely past Sunday. 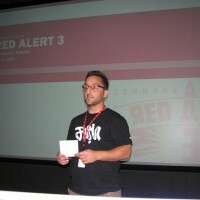 The Red Alert 3 Community Summit was a fantastic experience. I would personally like to thank our C&C Community Manager, Aaron “APOC” Kaufman. It was great to finally to have finally met him in person for a change. 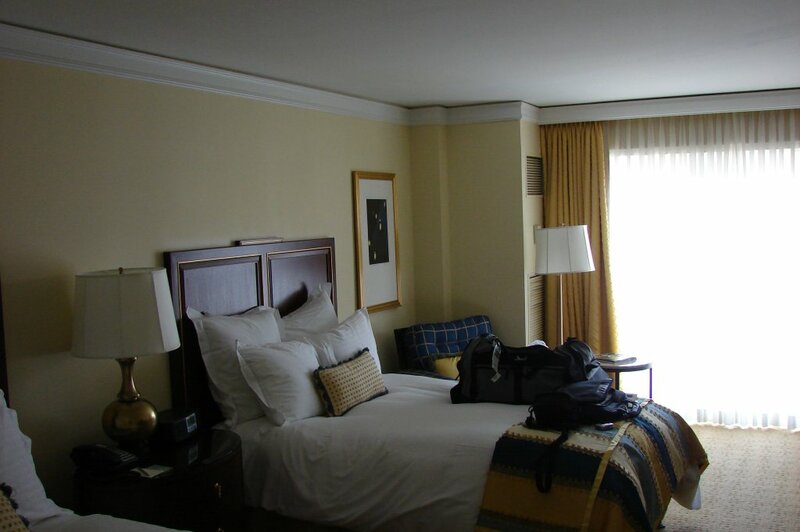 APOC was responsible for getting us over to Los Angeles and making sure we were all taken care of during our stay. And thanks to all the great community guys I managed to have some chats with. The entire trip was something I will never forget. Who knows, if CNCNZ.com is invited to another one I may consider going again. I’ll end this long article simply by saying….